Neat idea, right? Have he and Andrew Norcross – a fellow WordPress developer – create a plugin during the course of a WordCamp that could be released for free. 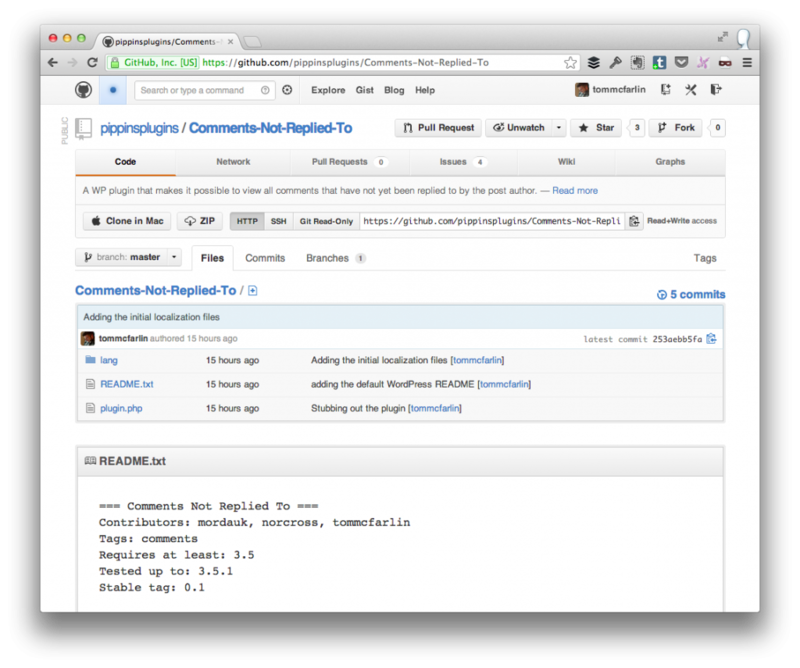 @pippinsplugins @norcross write a plugin that identifies all comments that have not been replied to by the post author. You can actually read the entire conversation here. This has been a plugin that I’ve wanted for a long time, and I assume anyone who’s actually maintained a blog for a significant amount of time would do the same. As it turns out, I’m going to be joining Pippin and Norcross in writing a plugin for exactly this. And we’re gonna do it live. Comments Not Replied To Plugin available on GitHub. Easily see which comments have not received a reply from each post’s author. Though this plugin will eventually be released in the WordPress Plugin Repository, we’re going to be keeping it on GitHub so that at any course during its development you want to install it, you’ll be able to download it and do so. Of course, we’ll also be looking to talk with you guys via Twitter about features you’d like to see, issues you may experience and so on. At any rate, it’s gonna be fun and hopefully doing the development live will add to it. This sounds like too much fun for you guys! Hope it comes out great and we can all benefit from your work and expertise. Sure thing, Martin – will have a post about it here. Open an issue on GitHub and the team and I will look into as soon as possible (though I can’t guarantee any particular turn around as this was a free plugin we all built in our free time and are currently backlogged with other work).